The Troodos mountain region of Cyprus contains one of the largest groups of churches and monasteries of the former Byzantine Empire. The ten monuments included on the World Heritage List, all richly decorated with murals, provide an overview of Byzantine and post-Byzantine painting in Cyprus and bear testimony to the variety of artistic influences affecting Cyprus over a period of 500 years. The structures display elements that were specific to Cyprus and were determined by its geography, history, and climate, including steep-pitched wooden roofs with flat hooked tiles, in some cases providing a second roof over Byzantine masonry domes and vaulted forms, while exhibiting Byzantine metropolitan art of the highest quality. The architecture of these churches is unique, confined to the Troodos range and almost certainly of indigenous origin. They range from small churches whose rural architectural style is in stark contrast to their highly refined decoration, to monasteries such as that of St John Lampadistis. They also contain a wealth of dated inscriptions, an uncommon feature in the Eastern Mediterranean during the Middle Ages, which makes them particularly important for recording the chronology of Byzantine painting. Important examples of the 11th-century iconography survive in the churches of St. Nicholas of the Roof and Panagia Phorbiotissa of Nikitari. Within Panagia tou Arakou in Lagoudera and St. Nicholas of the Roof are found important wall paintings from the Comnenian era, with the first being of exceptional artistic quality attributed to Constantinopolitan masters. The 13th century, the early period of Latin (western) rule in Cyprus, is well represented in the wall paintings of St. John Lampadistis in Kalopanagiotis and in Panagia in Moutoulla, which reflect the continuing Byzantine tradition and new external influences. 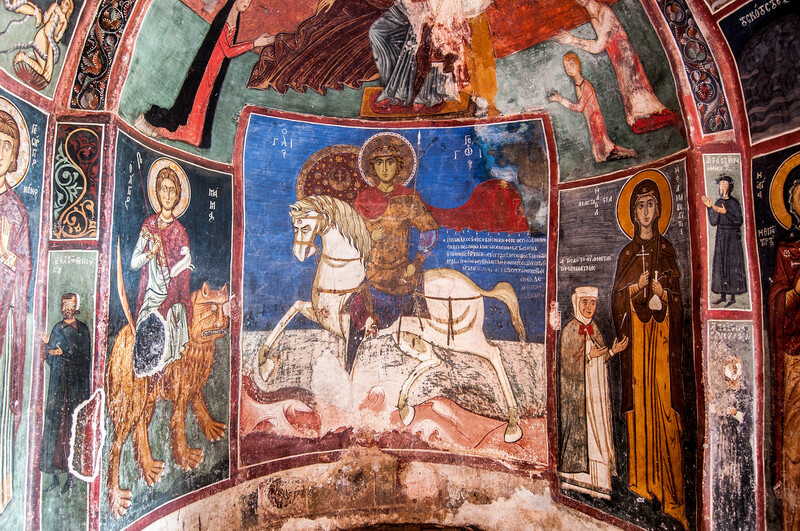 The 14th-century wall paintings at Panagia Phorbiotissa, Timios Stavros at Pelendri and St. John Lampadistis also display both local and Western influences, and to a certain degree, the revived art of Paleologan Constantinople. In the late 15th century iconography at Timios Stavros Agiasmati and Archangelos Michael, Pedoulas exhibits once again the harmonious combination of Byzantine art with local painting tradition, as well as some elements of Western influence, which are different, however, from the earlier series of St. John Lampadistis that was painted by a refugee from Constantinople. The Venetian rule, which began in 1489 was reflected in the development of the Italo-Byzantine school, and the most sophisticated examples can be found in Panagia Podhithou and the north chapel of St. John Lampadistis, both successful examples of Italian Renaissance art and Byzantine art fusion. Finally, the wall paintings of the Church of the Transfiguration of the Savior in Palaichori form part of the Cretan school of the 16th century. The previous two visits to world heritage sites in Cyprus were pretty easy. This one was a bit more tricky, or at least it was for me. This site consists of ten small churches in the mountainous Troodos region of Cyprus. The churches are very small and if you drove past them, you would never guess that they are anything special. The problem I had my first day was that they don’t use the UNESCO symbol when pointing out the churches. You will find road signs that are brown colored with a church symbol on them. If you get to one of the villages, just follow those signs. The roads in the villages are often quite narrow and winding. You could easily spend an entire day driving through the mountains, visiting all 10 churches. In addition to finding the churches, the other hurdle you have to overcome is if they are even open. We got lucky and all 4 of the churches we visited were open around midday on a Friday. In researching this site I found that many people who have visited in the past found the churches were closed and you have to find someone in the village (usually a priest) to come and open it for you. Also, most of the churches do not allow any photography. I received permission to take this photo in the church in Nikitari. If you are just looking to visit one, I think the Lambadhistis Monastery in Kalopanayiotis is your best bet as it is an active monastery and they have regular visiting hours. We arrived at 1:30 pm and just had lunch while we waited for it to open at 3 pm. They were very reminiscent of the Boyana Church outside of Sofia, Bulgaria. 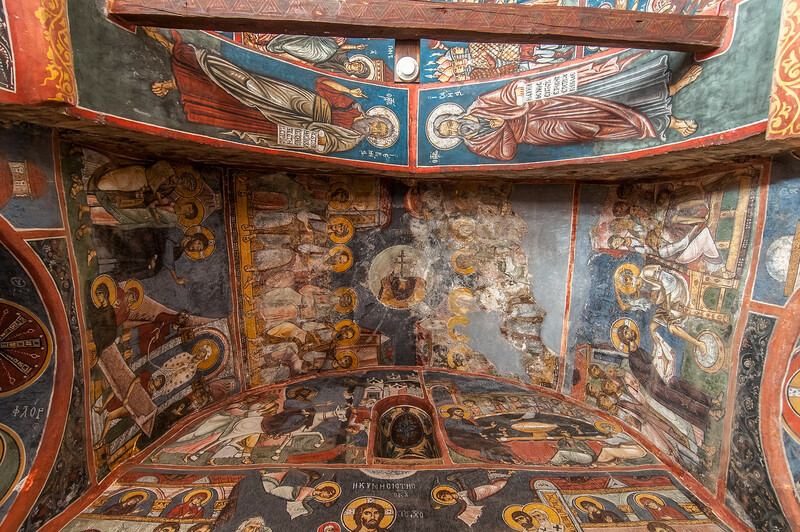 The Painted Churches in the Troodos Region is a cultural UNESCO World Heritage Site in Cyprus. It was inscribed into the UNESCO list in 1985 and extended in 2001. These churches are located in the Troodos Mountains within Central Cyprus. 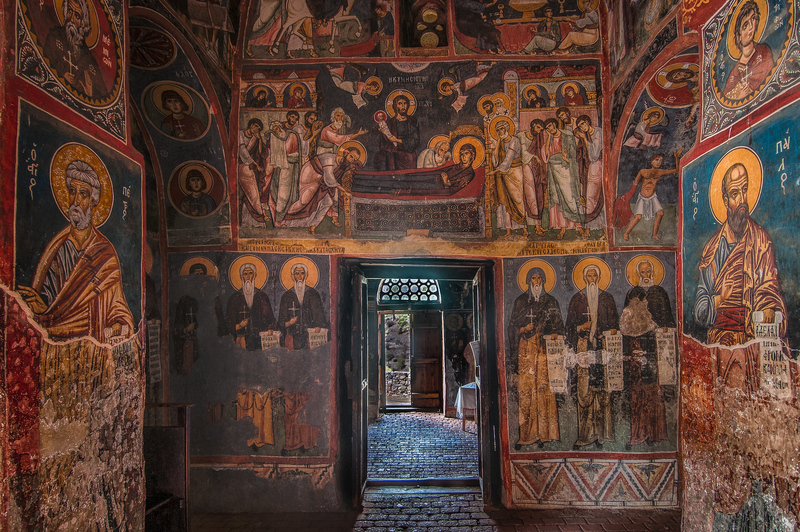 There are 10 Byzantine churches in total that are included in the UNESCO site Painted Churches in the Troodos Region. These churches are recognized for the early history of Christianity in this part of Europe, as well as for the old and colorful frescoes that are painted all over these churches. Despite the fact that these frescoes were dated to early 11th century, most of them are still in excellent condition. Discover the deep religious roots of Cyprus with universally significant sites such as the Painted Churches in the Troodos Region. You can follow the path of the churches that are included in this list to learn about the evidence of faith in the region, as well as behold the well-preserved churches and monasteries. Ayios Nikolaos tis Steyis (Saint Nicholas of the Roof): This church is located in village of Kakopetria along the Karkotis River banks. It is the sole surviving monastery that was founded in the 11th century that saw its height during the mid-Byzantine period and went into a decline in the 18th century. Ayios Ionannis Lampadistis (Saint John Lampadistis): Built in 1731, this church and monastery are one of the most important components of the UNESCO site Painted Churches in the Troodos Region. It holds the saint’s tomb, which is dated at 12th century. There is also a Byzantine museum located near the church. Panagia (Church of Our Lady) Phorbiotissa (or Asinou): This church is located on the foothills of the Troodos mountain range. There are two distinct parts to this church: 1) vaulted single-aisled nave and 2) narthex (which is a later addition to the church). The interior is covered with wall paintings, which were created at various times. Panagia tou Arakou in Lagoudhera: This particular church part of the UNESCO site The Painted Churches in the Troodos Region is located specifically between the villages of Saranti and Lagoudera. This 12th-century church is considered as one of the most important Byzantine churches on the island. Panagia tou Moutoulla in Moutoullas: This church was built and decorated through the effort of Ioannis of Moutoullas (with the help of his wife). Many believe that this church was initially built to be used as a private chapel. The church is unique for its carved wooden basins, of which many other churches in the village are known to have too. Church of the Archangel Michael in Pedhoulas: The Church of the Archangel Michael in Pedhoulas is a timber-roofed church that was built and decorated with frescoes in 1474. It was built through the donation from Priest Vasilios Chamados. Timios Stavros (Church of the Holy Cross) in Pelendri: This church is located in the village of Pelendri and is one of the churches recognized into the UNESCO site Painted Churches in the Troodos Region. This church is recognized because of the unique 12th-century frescoes that adorn its interior walls. Panagia Podhithou (Church of the Virgin Podithou) in Galata: Located within the central area of the mountain range in Troodos. The wall mural paintings in this church are contemporary of its time when it was built in 1502. It features a single-aisle architectural type and comes with a steep-pitched roof. Stavros Ayiasmati (Church of the Holy Cross of Ayiasmati) in Platanistasa: This church is located on the eastern side of the Troodos Mountain range. It was built in the late 15th century and is known as a monastery church. Although the exact date when this church was built is unclear, the decorations were estimated to have been completed in 1494. Metamorfosis tou Sotiros (Transfiguration of the Saviour) in Palaichori: This church is the final component of the UNESCO site Painted Churches in the Troodos Region. It provides an overlooking view of the mountain range’s eastern section. It was founded in early 16th century and features a steep-pitched roof architecture style. It also features wall paintings that were influenced by various styles. Good job, Gary. It is interesting how much coasted the permission to take photos inside a church?